Home Prices Post Biggest Jump Since 2006 : The Two-Way It's now clear that the housing sector has bounced back from its long downturn. In March, prices had the biggest year-over-year gain since early 2006. This single family home was for sale last week in Encinitas, Calif.
Home prices in major cities across the nation were up 10.9 percent in March from March 2012, the biggest year-over-year increase since April 2006, according to the data trackers who put together the S&P/Case-Shiller Home Price Indices. -- While prices rose 10.9 percent on average across 20 metropolitan areas, the strongest gains were in Phoenix (22.5 percent), San Francisco (22.2 percent) and Las Vegas (20.6 percent). Cleveland (4.8 percent) and Boston (6.7 percent). 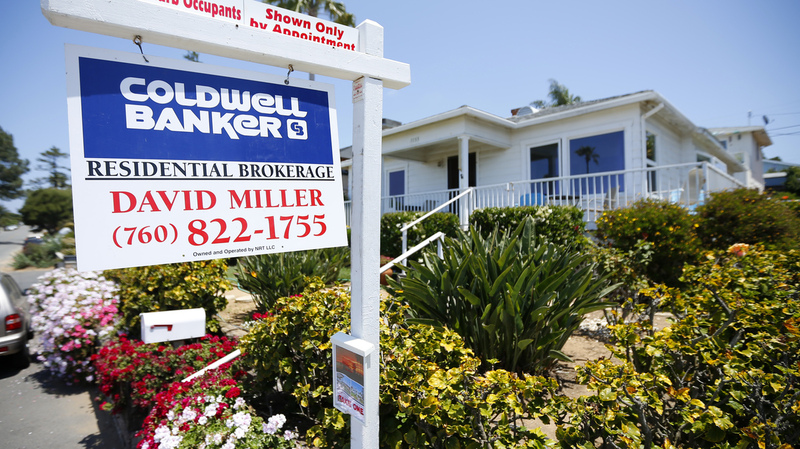 Tuesday's news follows many other signs in recent months that the housing sector has bounced back from a long decline that began when its so-called bubble burst in 2007. Last week on All Things Considered, NPR's Adam Davidson talked about how it's now irrefutable that housing is on the rise again.